WTF President Chungwon Choue takes an oath of office as the new president of the GCS International in a ceremony at the Lotte Hotel World in southern Seoul on Nov. 4, 2006. Dr. Chungwon Choue, president of the World Taekwondo Federation, was nominated as the new president of the GCS International in a ceremony in Seoul on Nov. 4, 2006. In his inaugural address, Dr. Choue said, "The greatness of the GCS comes from our founder and founding leaders who dedicated their lives to establishing a brighter society that is based on strong convictions in human values and global peace." "I suggest three core values to implement our missions and to bring brighter future to the GCS: leadership, service and diversity," Dr. Choue said. "First, we will focus on making the GCS one of the most influential organizations in the world. Second, as the GCS stands for goodwill, cooperation and service, I believe service to others is a foundation of the GCS," he said. "Third, I would like to emphasize the diversity in terms of membership and activity programs which can broaden and improve the capacity of the GCS. The GCS will be open to people of all political and religious perspectives, and to men and women of all races, as long as they have sincere aspirations for global peace and prosperity. This is a vital goal for the future of the GCS." 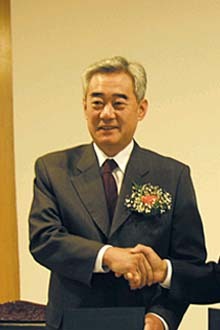 He made the remarks during the 2006 GCS International Convention at the Lotte Hotel World in southern Seoul. The event drew about 600 people, mostly members of GCS International from at home and abroad. The GCS International is a U.N.-recognized nongovernmental organization (NGO) with a special consultative status with the Economic and Social Council. GCS stands for global common society. Since its establishment in 1979, the GCS International has been headed by Dr. Young-seek Choue, founder of Kyung Hee University. The headquarters of the GCS International is located in Seoul, Korea. Dr. Young-seek Choue, the outgoing president of the GCS International and father of WTF President Chungwon Choue, delivered his special video message to the participants. The GCS International, with a membership of 38 countries, was set up to effectively pursue the goals of the GCS movement all over the world, which promotes the three spirits of goodwill, cooperation and service. The movement also pursues five major movements – the movement for a healthy society; the movement for a better living; the movement for the love of nature; the movement for the restoration of human dignity; and the movement for global peace. The movement acted as the catalyst for the United Nations' designation of every third Tuesday of September as the International Day of Peace and the year 1986 as International Year of Peace. The GCS International, in cooperation with Kyung Hee University and the International Association of University Presidents, has since 1986 held an international peace conference annually.